Forecast low: 26. Actual low: 23. Fruit damage: high. I've tried protecting tree blooms in the past, but haven't had any luck with wrapping trees and don't want to try to run sprinklers all night. So we just roll with the weather, some years not getting any tree fruits at all. Low-lying plants are much easier to protect. 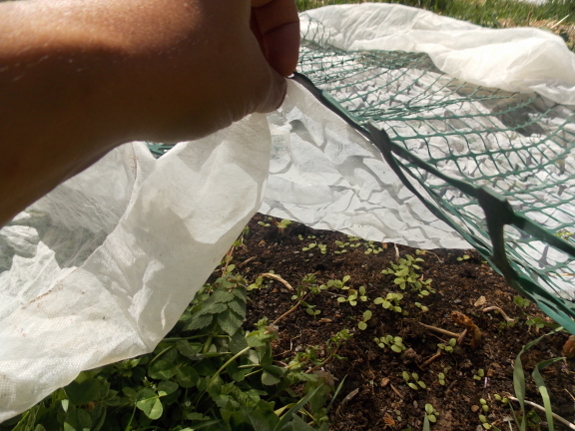 I pulled out all of my old pieces of row-cover fabric to shelter tender vegetable seedlings like lettuce, broccoli, and cabbages. At this time of year, I often cover up strawberries too, but only a few had even opened as far as the flowers shown to the right --- "popcorn stage." 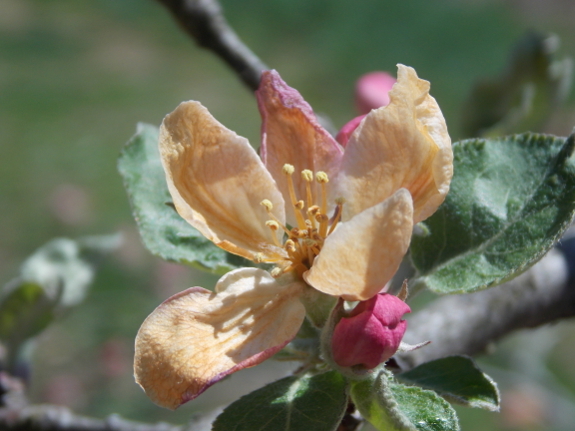 The popcorn flowers will have gotten nipped, since they can be damaged when the temperature drops to 26.5, but tight flower buds are okay down to 22. I figured it was better to miss five or ten of the earliest strawberries than to lose whole beds of broccoli. 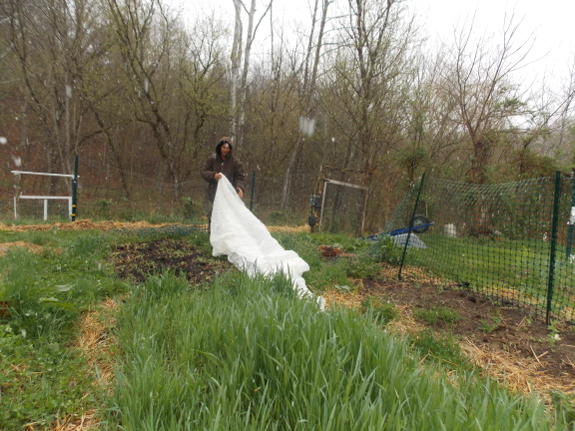 Under their covers, all of the seedlings came through with flying colors, even though the freeze was so hard that weeds in the yard like clover and dock were nipped back. I usually don't cover peas, but I was a little concerned about them and carefully laid a row cover over half of the beds. Interestingly, of the uncovered beds, one (in front of the trailer) was moderately nipped and one (in the mule garden beside quick hoops) looked just fine. A few pea seedlings elsewhere in the mule garden came out from under their cover and those were nipped, so it seems like microclimate effects are hard at work in the garden. The good news is that, even if we don't get any tree fruits this year, we should have plenty of berries to go around. Our blueberry flowers are in what's called a tight cluster, safe down to 20 to 23 degrees, so most should be okay. Blackberries and raspberries haven't enough thought about blooming, and their leaves came through the freeze just fine. Add in strawberries and figs and we'll definitely enjoy fruits this summer --- yet another reason to grow berries even though they take a bit more work day to day than fruit trees do. Yeah, so I'm commenting here for the first time. I've been reading a while now, half-year? And so a THANKS are in order, first off. For all the tips and sharing and good information you've posted. Love this chart referenced on the fruit tree kill. So maybe I'll start commenting here more often. I follow a few other 'farm blogs' but mainly on Wordpress. Anyway, much blessings to you in your endeavors, good thoughts and love your way, from Indiana, Eumeaus. Here in s.w. Oregon all our fruit trees have bloomed! Yikes!! 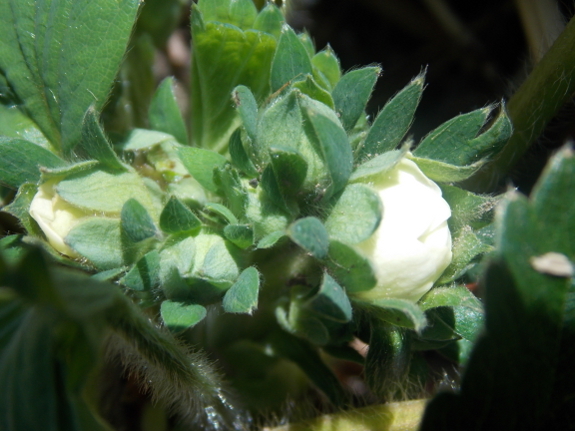 My strawberry plants are blooming and Mt raspberry plants are loaded with flower buds. Peas are up and garlic is growing. I have taken the chives Swiss chard and kale out of the green house. Just praying that no snow or heavy frost appears. Any updates on how the Hardy Kiwis did? Ours our loaded with blossoms this year and we were lucky enough to not dip below freezing here. The cuttings I stuck in a pot seem to have a few that may have rooted, but all the cuttings I completely buried seem to have done better. I will update you again later. Brian --- Their buds were just barely starting to open into leaves when the freeze came, so of course they got nipped. That may be the story of the hardy kiwi on our farm, but I'll wait and hope that maybe they can survive that nippage and still give us flowers this year. That's awesome that yours is blooming so well!